Back again with another review. This time I went to see ‘Sweeney Todd – The Demon Barber of Fleet Street’ at The Mercury Theatre. 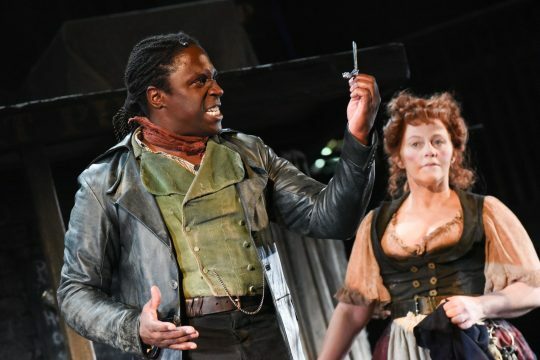 The show starred Hugh Maynard as Sweeney Todd, famous for being cast in West End shows such as The Lion King and Miss Saigon and also starring Sophie-Louise Dann. Famous for castings in West End shows such as ‘Bend It Like Beckham’ and ‘Made in Dagenham’. Photo: Sweeney Todd holding high a razor, with Mrs Lovett in the background. All of the cast throughout the show were fantastic, however I have to mention this next point. The chemistry between Hugh and Sophie was amazing! Watching them both on stage together, you honestly got a sense of the two characters having a close relationship. The singing from Hugh, Sophie and all of the cast was first class! Acting was second to none, and the use of lighting and steam/smoke made the sets feel so realistic. The set itself was brilliant and something which I personally have never seen before on any stage. The only way I can best describe it, is a massive 3D cube, with a quarter of the wall removed, a platform forming Sweeney’s barber shop with Mrs Lovett’s Pie Shop underneath. With each side of the cube representing a different part of London. Even if your totally blind, you will still get a kick out of the show. The Mercury Theatre offer multiple Audio Described Performances on certain Matinee performances depending on how long the show runs for. The package includes a ‘Touch Tour’ before the show, and then audio description headsets during the performance. This is something which I have experienced a few times at The Mercury and I honestly can’t fault it! 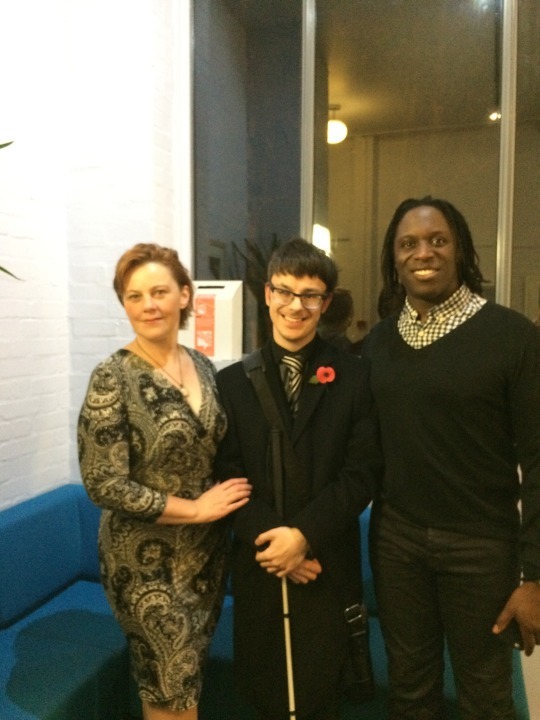 Photo: Me and the two main leads Hugh Maynard and Sophie-Louise Dann. This show is defiantly in the Top Five shows I have seen so far this year, and yes I know there is more to come! Why this show and exact company are not performing this in London’s West End I don’t know, cause I sure would pay the money! If you have time in the next couple of weeks to go see this show, trust me you will not be disappointed! Follow Me All Over The Socials!